Now let us go the recipe. 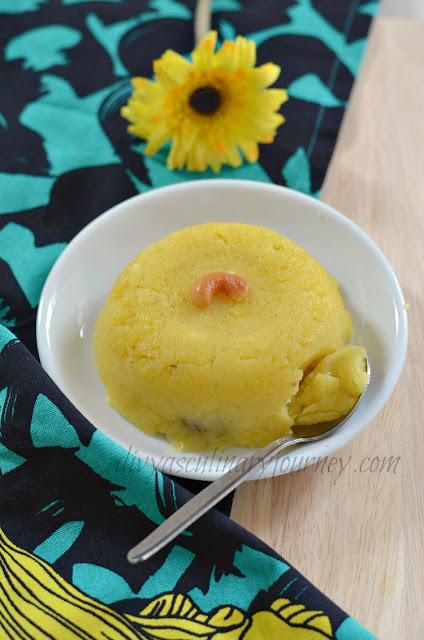 Pineapple kesari is made with rava/ sooji , sugar, ghee, pineapple and loaded with cashews and raisin. It is a popular sweet dish served in weddings and other functions. 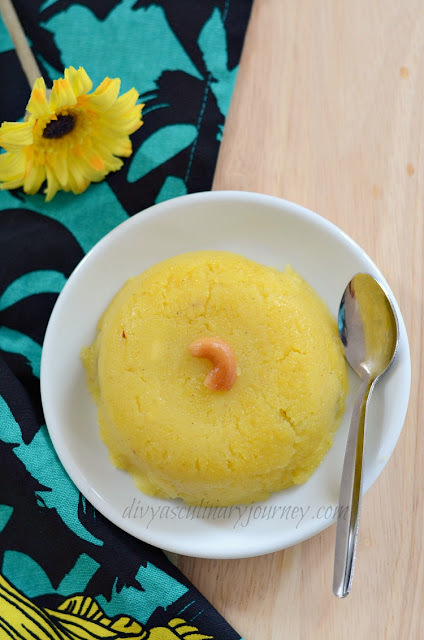 Pineapple Kesari is a popular sweet in South India made with rava, sugar, pineapple, ghee, cashew and raisins. 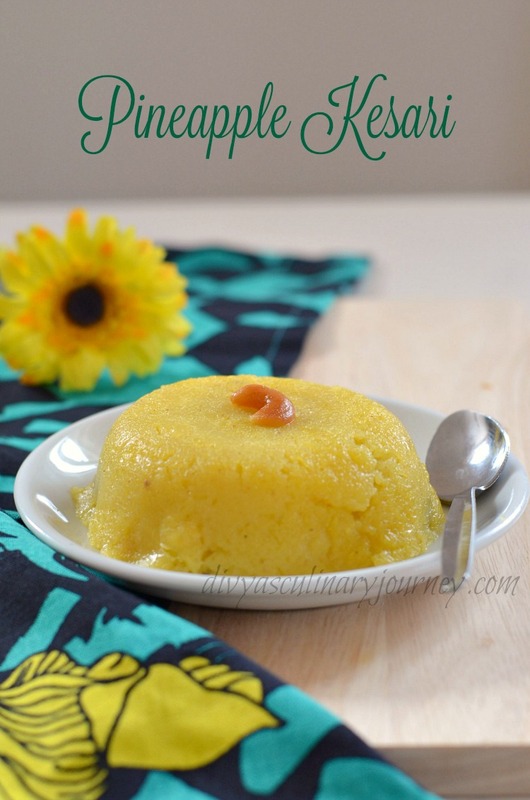 Learn to make perfect pineapple kesari using this easy recipe. Cashews : 14 – 15 nos. Raisins : 14- 15 nos. Cardamom : 4 – 5 nos. Divide the pineapple into 2 equal parts of 1/4 cup each. Puree one part while chop the other part into small bite sized pieces. Keep them ready. Remove the cardamom skin and powder the seeds alone with a tablespoon of sugar and keep it aside. Dry roast the rava till light aroma comes, no need to change in colour. Then transfer it to another plate. To the same pan, add 2 Tablespoon of ghee and fry cashews and raisins and keep it aside. Now to the same pan add roasted rava and cook for 2 minutes in medium heat. In the meantime, in another pan heat 1 1/4 cup of water, mix food colour to this water. 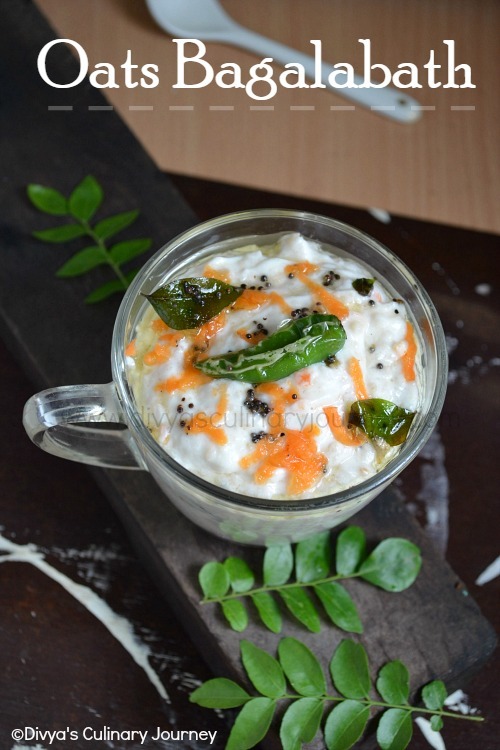 Then add this warm water to roasted rava and mix well and cook till water is absorbed. Take care while adding water, it might splutter. Now add the sugar and mix well. The mixture will become slightly watery and loosen up. Then add the pineapple puree and chopped pineapple to the mixture and cook till the mixture leaves the sides of the pan. Now add the powdered cardamom and mix well. Add the remaining ghee and the fried cashews and raisins. Mix well and turn off the heat. As we don’t prefer overly sweet kesari, only 1/2 cup of sugar is used here. You can add 1/4 cup more if you want it more sweet. If you do not prefer pureeing the pineapple you can chop them and add or vice versa. But if you want to add bigger pieces of pineapple instead of bite sized pieces, then I would suggest you to cook them in water for 2-3 minutes and then add to kesari. This will make them soft. If you do not prefer to add food colour then soak a pinch saffron in 2-3 tablespoons of warm milk and add it at the end along with powdered cardamom. If you prefer, you can add 2-3 drops of pineapple essence. Ghee plays vital role in the texture and flavour of the kesari. If you want add more ghee but don’t reduce the quantity. I felt the kesari tasted better when it is completely cooled. You can store leftover kesari in the refrigerator. But slightly warm it to loosen the ghee that has hardened before serving.